Ms. Chorn Sopheak is a volunteer working on the ‘Targeted Educational Strategies for Pro-Poor Community Development’ in conjunction with SIPAR in Sambo Commune, Sambo Distict, Kratie Province. This program promotes reading among children and the youth. Sopheak has been working with the commune to promote education, through heading a youth group, and has been helping the children of the community with their homework and English. 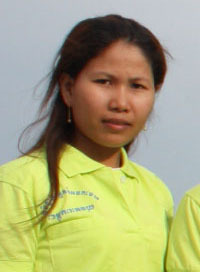 Sopheak has learned so much from her time in the commune and has become part of the community. She made paper flowers for the temple, which then raised funds for the village, for Khmer New Year and she intended to spend the Khmer New Year with the community but she had to return home to visit her mother who had an accident. The commune chief offered to pay for her ticket home a sign that Sopheak is a welcomed member of the community. Sopheak who is known as ‘teacher ‘in the commune said her experience has taught her valuable life skills and she has leaned to effectively negotiate. Initially the parents in the commune didn’t want their children to participate in the youth groups but after working with the parents they agreed and soon saw value in the youth groups and they saw that Sopheak inspired the community to become actively involved. Sopheak and the community have mutually benefited from her work there. ‘’I have become a facilitator of change and part of this wonderful community that is now accepting of new comers and knows how to run youth groups and mobilise its members for positive change’’. Being a Youth Star volunteer changed Sopheak’s life and her own community’s attitude toward her and her family. In the past people in her village were not friendly, because Sopheak was poor, and lived only with her mother who is a widow. Her own commune is now proud of her new found confidence and ability to talk with the authorities. The commune has now asked and that she use her knowledge to improve and set up similar program in her own community.